Matilda is a 5-month-old flashy fawn boxer ... she's a total clown. She loves all people, especially children. 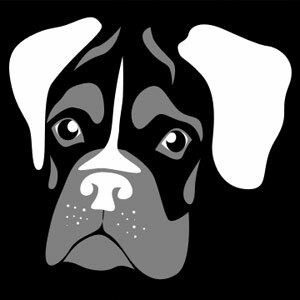 Let your friends and neighbors know which dog breed is best by carving a pumpkin that looks like your favorite canine [Boxers, of course!]. Your dog is the best dog in the world, right? So show the world how much you care about Max or Buddy or Molly or Princess by carving a pumpkin with his or her likeness. 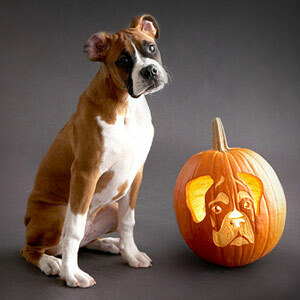 The American Kennel Club's list of top breeds inspired this series of pumpkin-carving stencils. Start by cleaning out the pumpkin, scraping the flesh thinnest in the region in which you'll carve the design. Attach the pattern (enlarged on a photocopier) to the pumpkin with tape. Use a pin to make closely spaced pin pricks along the stencil lines, piercing the paper. Remove the pattern. Cut completely through solid lines (as shown on the stencil), but only peel away the skin within the dotted lines to enhance features. 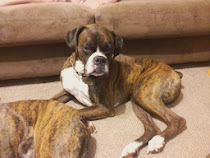 (make sure to include your Boxer in the pic too, of course! ).